A remote workforce can have a number of advantages for both the workers and the employer. It can also, however, present challenges that make managing a remote workforce problematic. According to Global Workplace Analytics, approximately 50 percent of the U.S. workforce is engaged in some form of telecommuting, while 80 to 90 percent of all American employees say they would like to work remotely at least part of the time. Many employers are leveraging this trend by offering remote work opportunities as an approach for attracting preferred work talent. Although this can indeed be a win-win for many organizations and their employees, managers often find that adapting to the demands of managing a remote workforce challenging. There are a number of considerations with managing a remote workforce. Managers understandably are concerned with the actual performance and productivity of employees they cannot see. Remote workers, on the other hand, can feel isolated and overlooked. "Some leaders worry about being effective in a virtual environment, because if they can't physically oversee what is happening, how will they know that work is being done?" said Giselle Kovary, co-founder of Toronto-based n-gen People Performance. "You need someone with a progressive leadership style who is not a micromanager." Kovary recommends setting up performance management processes with SMART goals (Specific, Measurable, Actionable, Relevant, Timely) and clearly defined competencies that make it possible for leaders to accurately assess the performance of various team members. Managers can then evaluate employees by their accomplishments, rather than the number of hours they spend in the office. The reality of a remote, or mobile, workforce is a growing trend. In fact, some experts believe that the numbers of remote workers will continue to increase rapidly over the next few years. 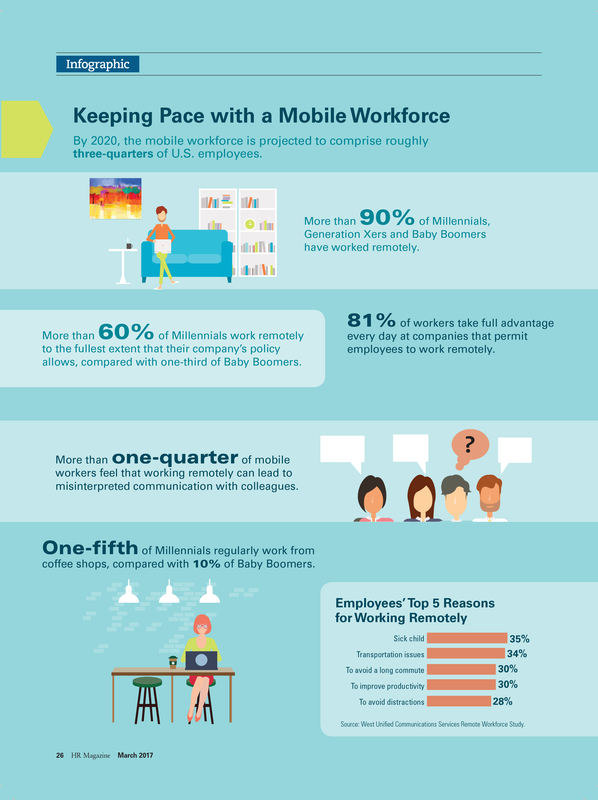 This infographic from SHRM's HR Magazine, details some of the statistics on the mobile workforce movement. Whether your remote workforce is made up of actual employees or independent contractors that you outsource to, managing that workforce effectively is critical. Managers need to ensure productivity while also maintaining a positive culture for all workers. Some data suggests that employee turnover can be higher when organizations don't have their workers on site. Problems such as technology issues and lack of communication can strain the manager-worker relationship in a remote workforce situation. Consequently, managers need to focus on specific tactics and best practices when working with remote employees. There are a multitude of considerations when it comes to managing remote, or mobile, workers. Employee classification, payroll, supplying company-owned equipment, etc. are just the tip of the iceberg, so to speak. There are, however, some fundamental best practices that should be established in order to be successful with a remote workforce. Be clear on expectations for work to be done and how it will be conducted. These expectations should include goals, timelines, and how workers will be held accountable for their deliverables. Document these and revisit them regularly. It is important when managing expectations that both the managers and workers are focused on goals and productivity. This means placing a priority on the work that is being accomplished, not what is being done in the moment. The point of managing a remote workforce is accomplishing goals and objectives, not filling up hours with activity. Building a community that actively includes mobile employees is important for maintaining an engaged remote workforce. Be intentional in creating an employee community and a corporate culture that fosters inclusion. Avoid creating a perception of remote staff being relegated to a secondary role in the company culture by making use of virtual meetings. Celebrate special days such as birthdays or company milestones, and regularly recognize remote employees publicly. Managers should engage with remote workers each day using collaboration tools, shared online documents, phone and chat tools, and video conferencing. Utilize these tools and software not only to communicate, but to engage and include workers on a personal as well as professional level. It is critical to ensure that both managers and employees are communicating clearly. Avoid being dependent on email communications or chat tools. Face-to-face conversation using various video tools is essential for clear communications. It is imperative that directives and expectations are repeated, clarified and confirmed to avoid misunderstanding and miscommunication. Effectively managing a productive remote workforce requires a communication strategy. Establish and schedule weekly formal check-in meetings in addition to appropriate meetings for daily needs and issues. Plan regularly scheduled team meetings which can include weekly, monthly, and annual meetings. In addition, communication strategy should include training or coaching programs. Remote workers need technology that work effectively and reliably. Good technology will ensure that they have access to files, information, tasks and deadlines they need to accomplish their jobs. Be sure that everyone is properly trained and provided with the right tools. Some popular tools used with remote workers include Slack, Asana and Trello. Your organization should invest in reliable tools to ensure collaboration and effectiveness for every remote worker. In addition, you must ensure that every worker not only has unhindered access to these tools, but that they are also able to use these tools properly and efficiently. It may be stating the obvious, but technology is absolutely critical to the success of a remote workforce since almost everything hinges on being able to consistently access the Internet. HR staff have a growing and demanding role in recruiting, hiring, and continually training employees. In addition, they are responsible for other functions such as employee development, payroll management, employee records compliance, and managing employee benefits. Outsourcing is increasingly becoming a cost-effective and strategic option. Accuchex can help you in managing your HR needs, payroll processes, and staying on top of compliance demands. Get your Free Download: Payroll Outsourcing Guide to help you make an informed decision or call Accuchex Payroll Management Services at 877-422-2824.